Warm weather, great food. Win, win. 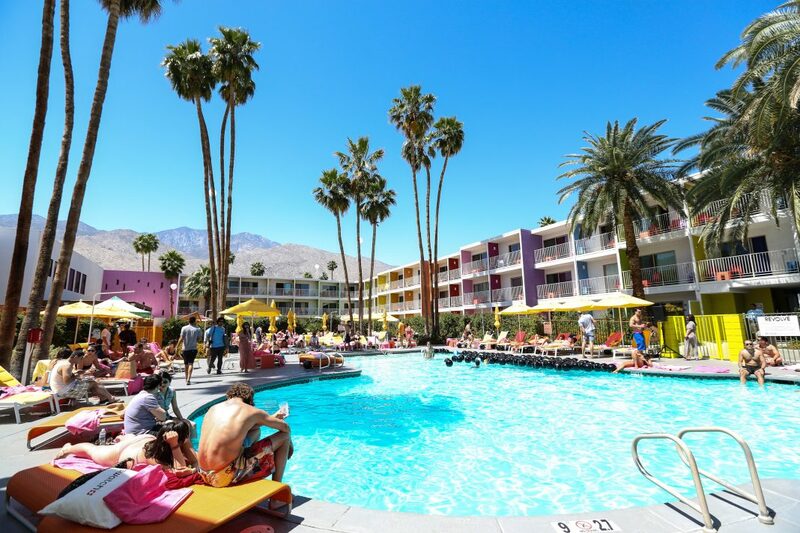 You head to Palm Springs for one of two reasons: a music festival or to do absolutely nothing—preferably poolside. In both cases, cooking is probably not on the agenda, and you’re likely spending a lot of your time shirtless. But as with any resort town, a lot of Palm Springs’s most acclaimed food options rate high on the ‘big deal’ spectrum (i.e., expensive, and/or requiring garments that cover more than half of your body). When you want to eat, but not necessarily dine, here are our favorite NBD restaurants in the desert. The queen of the Palm Springs restaurant scene is Tara Lazar, and Cheeky’s is her first and favorite baby. Breakfast and lunch are the focus, with key lime waffles, prime rib hash, and a bacon flight. Allow us to repeat: bacon flight. Because why eat plain bacon when you can have bacon glazed with dark chocolate and Fireball? There’s no avoiding the hotel restaurant here, and most are as banal as they are overpriced. But Norma’s at the Parker is the exception to the rule. A sprawling patio is home to a ridiculous stack of banana macadamia nut pancakes during the day, crispy fish tacos and pot pie by night. The Ace has always had a more than respectable diner at its heart, but just last month the menu was taken over by Taco Maria’s chief badass, Carlos Salgado. That means buttermilk fried chicken cemitas, confit duroc pork tacos, and fried catfish tortas. The best bagel we’ve ever had in the state of California—for reals—comes from this off-the-beaten-path shop that caters to locals. Shiny, crusty rounds come in the standard slew of flavors with housemade schmears. Sometimes you just need to eat right smack dab on the main drag. Between all the mediocre Mexican joints and expensive clubstaurants along Palm Canyon Drive is this quaint little spot, specializing in Belgian-style steamed mussels and fries, coq au vin, and real deal Belgian waffles in the a.m. The beer list is nothing to sneeze at, either. There’s something about Palm Springs that has us craving Mexican the second we ditch off the 10. Maybe it’s the cactus. El Mirasol is the most reliable of the central, touristy Mexican joints. The mole poblano and pollo pipian are very respectable. All the more so after a margarita or two. This old school and beloved breakfast and lunch spot—known for its crackling German pancakes and overstuffed omelets—has been serving the town’s hungover hoards since 1960. Summer’s sweltering heat is a natural match for the flavors of Vietnam. Rooster & the Pig serves modern riffs on that country’s cuisine with dishes like lemongrass-glazed wings, spicy okra, jasmine tea leaf salad, and crispy whole snapper. Warm weather + golf + retirees = a very decent Jewish-style deli. If you’ve never had matzo ball soup in the desert, you haven’t really lived. Grab a loaf of rye to go. A former Greyhound bus depot now serves burgers, fries, beers, and milkshakes on a wraparound patio in the heart of downtown. Every town needs a great Indian buffet spot, and this is exactly that for Palm Springs. Blistered garlic naan, prawn vindaloo, and a $10.99 lunch special have us coming here at least once a trip. The Saguaro’s taco joint and tequila bar is, dare we say, the best Mexican spot in Palm Springs proper. Handmade tortillas, steak nachos, and golden crispy fish tacos are washed down by an impressive list of agave spirits. Tara Lazar (Cheeky’s) and her husband do everyday Italian at Birba, with wood-fired pizzas and handmade pastas enjoyed al fresco.